Saturday, 16 June this year was not only Bloomsday at Shakespeare and Co. Vienna, it also saw spillover crowds from the Vienna Gay Pride Parade and what is known as “National” Flash Fiction Day, which has really become “international” with submissions arriving from all over the world for the Flash Flood. And there was some Bob Dylan busking by Danny Chicago to take us back to a time of hope. I was pleased that my story, “The End of an Affair”, was accepted for helping to open the flood gates. The story was first published in Writers Abroad Magazine after a number of rejections, so I guess it does come down to finding that elusive reader who can be touched by your work. In between a super rendering of Bob Dylan songs Jean Almeida and I gave private readings in the bookshop where people were coming and going. Shakespeare and Co is tucked away from the mainstream, just round the corner from St Ruprecht’s, the oldest church in Vienna. I say private readings because we read to couples who wanted to hear what we had to say and delightfully hung onto all our words. (One chap even gave me a bottle of home-pressed olive oil as a thank you.) This was all done after a short introductory sketch on how James (Joyce) met Sylvia (Beach) and some words of what others thought of Ulysses – you can imagine – or can you? ‘a self-taught working man… egotistic, insistent, raw, striking, & ultimately nauseating.’ – Virginia Woolf in her diary, somehow reminding me, if that can be done backwards, of Lionel Shriver. Apart from flashes appearing every ten minutes throughout the day on the website, the NFFD 2018 anthology was also launched in faraway Bristol. 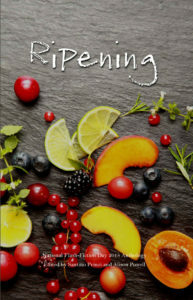 Its title is Ripening and its theme food. What could be more international! I´d been trying to get a story into the NFFD anthologies for several years, wondering if the “national” had something to do with my many rejections, especially as an Australian in Austria straddling the cultures of both and with little affinity for the notion of “nation”, or whether my stories were just not good enough for a “real” book. So I was thrilled that my story “Oysters” was included in the 2018 anthology, Ripening! I´m happy to see that publishing initiatives have opened up to working class writers and ones from backgrounds less represented, and that in at least one call, writers over 60 have also been targetted. Maybe one day “nationality” won´t matter at all and nor will the cliques to which one does or does not happen to belong. Ah, the arts. What made you think that you too could be spared l’air du temps? So it boils down to you just gotta do what you gotta do, and that to the best of your ability at whatever stage of development. 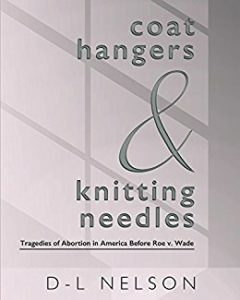 And on the note of some things needing to be done I can´t leave you without mentioning that my good friend, D-L Nelson has just issued an extremely well-researched book, Coat Hangers and Knitting Needles: Tragedies of Abortion in America Before Roe v. Wade. She says: This book is not copyrighted. Feel free to take what you need. We can’t go back. Would that America were receptive. So on that note, let us move forward, and as always, onwards! Ta, Sophie. This story is a new fresh flash and kinda political. I´ll be doing another reading at Shakespeare some day, but need to get all my new stories together. Or maybe the novel now doing its rounds. Thanks for the thumbs up. We must catch up. Hugs. Bravo for Oysters! Fond memories of the story as well as your first reading at Shakespeare & Co. Time flies.